Starting in April, I'll be teaching Wilton Cake Decorating Classes on Saturday afternoons from 2:00 - 4:00 at the Hobby Lobby off of Highway 96 in Franklin. 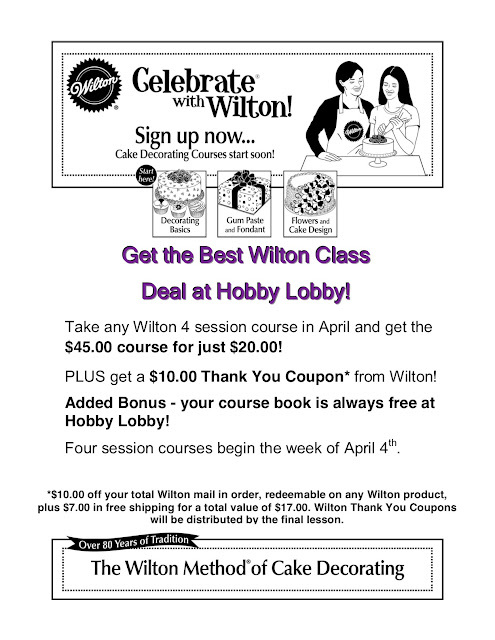 In addition to the fantastic price on tuition, anybody who takes a 4-week Wilton course (Decorating Basics, Flowers and Cake Design, or Gum Paste and Fondant) will receive a $10 "Thank You" coupon from Wilton. This coupon is good for $10 off your total Wilton mail-in order. PLUS, they're giving you $7 in free shipping, so that's a total value of $17! Decorating Basics starts at the Franklin Hobby Lobby on April 9th. See my Upcoming Class Schedule page for more details, or stop by the store to register.